One of the Greek gods has been up to no good and has stolen Zeus’s lightning bolt. Without it, he’s powerless and is out to seek revenge! You’ve been hired to help Zeus figure out who this wretched thief is. Does Hades have it in his underworld? Did Dionysus take it after one of his wild parties? Or was it that trouble-maker Hermes? Oh My Gods! is a fast-paced game of mystery, mischief, and deduction. 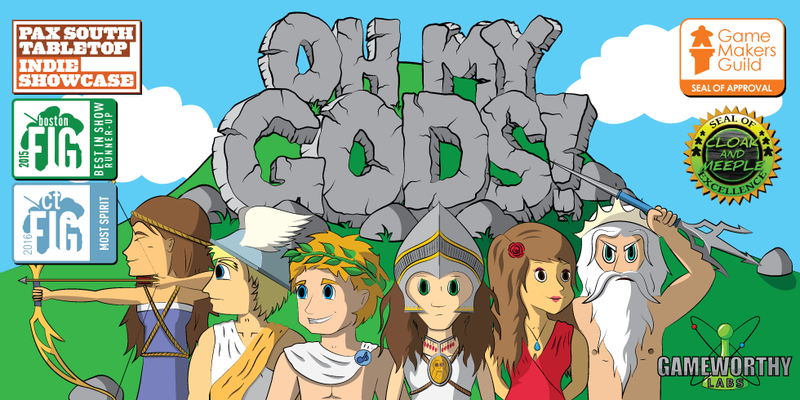 Race against your friends to search for clues, uncover hidden gods, and use their almighty powers. But watch out for the angry Zeus – he’s on the prowl and is ready to zap your game! Check out the Game Art here!